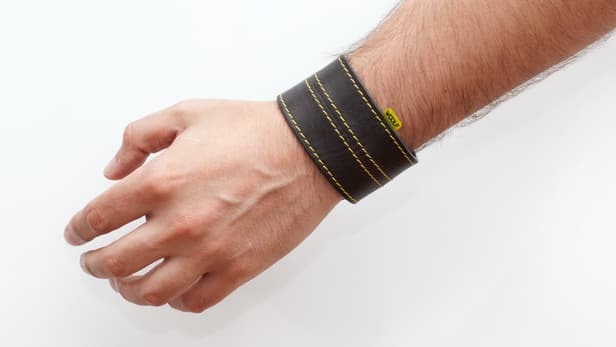 Has anyone heard or seen anything about the ‘Woolf Wristband’ – its supposedly warns of speed traps, a new wristband that promises to let you ride around on your bike like a madman without getting caught in speed traps. This seems like an idea that totally won’t backfire. Woolf is just a wristband that will alert bikers of speed traps, red light cameras, and upcoming crosswalks by using different levels of vibrations. There are dozens of apps available for car drivers that use GPS to detect the speed zones and send an audible alert. Riders can also use them if they have a Bluetooth helmet intercom. However, the WOOLF Wristband works without the need for an intercom, sending an alert to the rider via a vibration in the wristband. The vibration intervals will increase the closer you get to the speed zone, becoming continuous with 50km/h of the speed camera. It charges via USB, fits under leathers, and a charge should last you around two weeks of commuting. It is also got an accelerometer built in, but we are not sure what advantage that offers over and above the ones in your phone. The Woolf app tracks your speed so it knows when you’re going too fast, and Woolf says the service will be available soon in 65 countries around the world. It’s a nifty way to give riders the advantages some car drivers enjoy, without exposing their phones to the elements or taking their concentration off the road. It is not cheap, at €99 for presales on Kickstarter – but hey, given how expensive speeding fines are these days, if it saves you one ticket it is more than paid for itself. The app is compatible with both iOS and Android, and WOOLF is slated to be shipped starting in March 2017.